Twice a year we offer Refuge Vows at Dharma Refuge. If you would like to inquire about our next ceremony, express your interest in participating, or if you have questions about the vow please email Elaine our Program Administrator. Below is a letter from our teacher Sue Kochan, explaining the ceremony, the meaning of Refuge and answering common questions about taking these vows. Each Ceremony begins at 7:00 pm and includes a brief period of meditation and a Dharma talk by Sue about the Refuge Vow. We encourage those taking the vow to invite family and friends to share in your experience. and aspirations we have for our lives. I’ve been asked to explain a bit about the Refuge Ceremony we offer at least once a year. Everyone is welcome to attend. Some of you may choose to formally take the vow for the first time. Many of you will join us to renew your vow and offer your love and presence to those for whom this ceremony is a first. 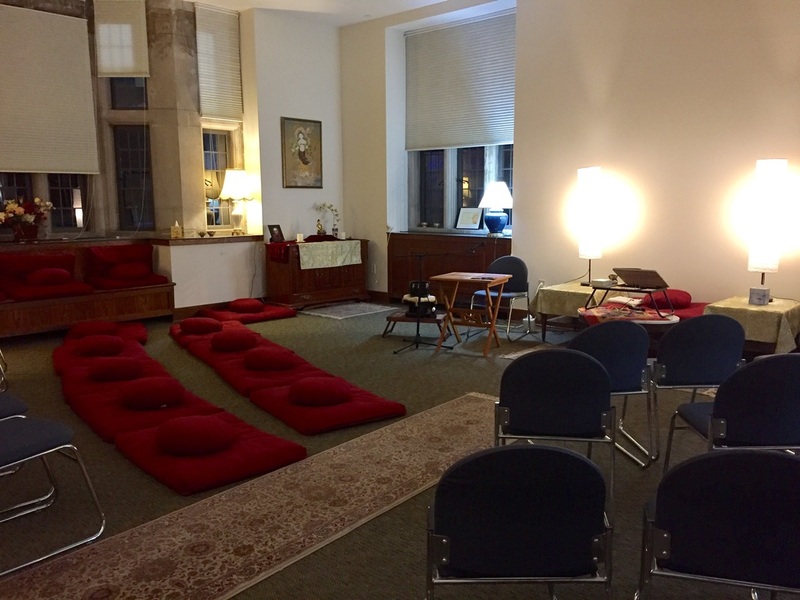 As always, family and friends are welcome to come to share your experience and the evening with the Dharma Refuge Sangha. Taking the Refuge Vow is making a commitment to the path of practicing Dharma. In fact, it serves in many ways as a doorway to realizing our own Buddha nature. The very act of walking through this door is one of setting a strong intention for one's life. It's a skillful means or intelligent method that involves consciously moving toward our longing to be free of suffering, such that the momentum of our life flows continuously in the direction of wakefulness. The essential point of Dharma practice is to transform the mind, and we devote ourselves to this inner journey when we formally take this vow. People who are considering taking Refuge for the first time often ask if it’s in conflict with any other faith tradition? My teachers have always told me it’s not. Rather it can be viewed as a strong support, marking a time of change in our life, a time when we are ready to turn inward and work with the conditions of our own minds and hearts, as a method to bring greater ease, happiness and meaning to life. Going for Refuge isn't something we do once. It's a lifelong dedicated inquiry into understanding what actually causes happiness and unhappiness, and what leads to freedom. Through our own practice and experimentation in applying the teachings of the Buddha to life, exactly as we find it, our movement toward wakefulness becomes a blossoming confidence and sense of ease—a knowing where to place our trust, and where to go for Refuge and fulfillment. We see how our inner transformation benefits those we love, those we find most challenging and the overall atmosphere of our life. A naturalness of being replaces the angst of living we experience when our "true" Refuge is obcured. As we percieve a turbulent world and unpredictable life, Refuge is an invitation to examine where we habitually turn for comfort, safety, sanctuary. As practitioners, our practice is one of taking Refuge in something we call the three jewels; the Buddha, the Dharma and the Sangha. Along the path, this unfolds as a deep contemplation of the meaning of the three jewels as our objects of Refuge. Ultimately, Refuge arises as something we call insight. The "absolute" Refuge being the Buddha's realization—we are "a lamp onto ourselves." Our own awakened nature is the Refuge we can rely on to cross "the stormy waves of birth, old age, sickness and death." Before the ceremony I will do my best to explain these objects of Refuge, how they function in our lives and why they are considered to be the precious jewels that support us as we seek to live within the biggest intentions and aspirations we have for our life. Learn more about the three jewels and what it means to take Refuge in each of them. We warmly welcome your presence, your support and your open heart. And, with joy we celebrate you, becoming a lamp onto yourself.